Yamaha BD-S1900 review | What Hi-Fi? If a new Blu-ray player is on the cards, you're currently spoilt for choice. Class-leading, feature-packed, budget machines can be picked up for Scrooge-friendly sums, so more expensive players have to work even harder to prove their worth. The Yamaha 'S1900 is one such. The player – a basic Profile 2.0-enabled machine with an ethernet socket and USB input for connecting external memory – has been styled to match Yamaha's home cinema amps. The remote control is uncluttered and simple to look at, but it feels cheap and main control buttons don't even glow in the dark. Disappointingly, loading times fall short of cheaper machines too. 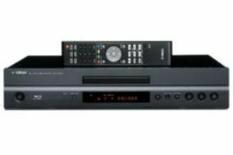 The biggest feature is the Pure Direct button, claimed to improve CD playback over stereo analogue outputs (and it does promote cleaner, more detailed sound). In essence, the Yamaha serves up a perfectly watchable picture. During Up, colours are vibrant and well rendered. Edge definition is solid and the player keeps a firm grasp on the images. Switch to the grittier action of The Taking of Pelham 123 and it keeps up the good work, picking out detail and producing natural skin tones. Sonically, the Yamaha favours a weighty approach. Spin Prince's I Would Die 4 You and the player stomps its approval, but could do with greater agility and insight. The bottom line is that while this is a perfectly decent player there's no real reason why you'd choose it over more affordable ones such as the Sony BDP-S760.